Wholesome Wave inspires underserved consumers to make healthier food choices by increasing affordable access to fresh, local and regional food. “Wholesome Wave is a unique and extraordinary program that supports low-income families and gives them access to fresh, healthy produce from farmers’ markets. This is a worthwhile and much needed program that has my full backing,” Pépin said. 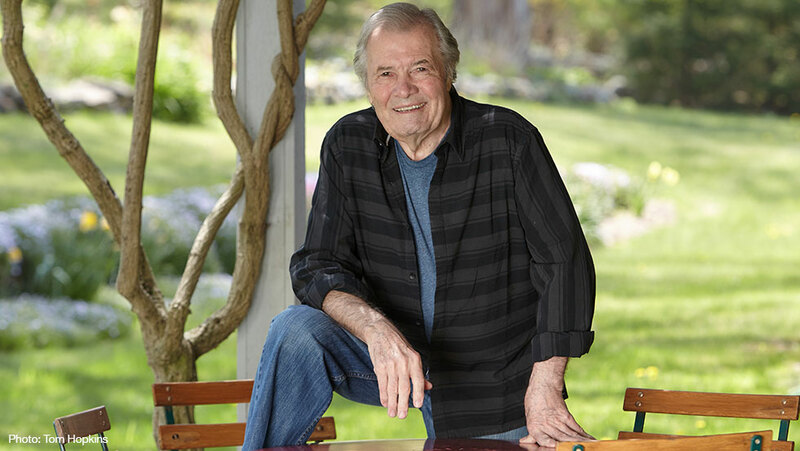 Our esteemed Julia Child Award jury selected renowned chef, cookbook author and culinary personality Jacques Pépin as the first recipient of the annual award. He has chosen two worthy nonprofits to split the $50,000 grant awarded by The Julia Child Foundation, Wholesome Wave and Boston University’s Metropolitan College Programs in Food & Wine. Renowned Chef Jacques Pépin has written more than two dozen cookbooks and hosted more than 13 popular public television cooking series. His collaboration with Julia Child in the PBS TV series, Julia and Jacques Cooking at Home, won an Emmy Award and a James Beard Foundation award in 2001. Pépin recently completed filming his 14th cooking series for PBS, Jacques Pépin Heart & Soul, for KQED in San Francisco, which airs in the fall of 2015, in time for Pépin’s 80th birthday. A companion cookbook, published by Houghton Mifflin Harcourt Publishers, will be released in early October, 2015. Born in Bourg-en-Bresse, France, near Lyon, Pépin’s love for cooking developed when, as a child, he helped in his parents’ restaurant, Le Pélican. At 13, he began an apprenticeship at the Grand Hôtel de L’Europe and subsequently worked in Paris, ultimately serving as personal chef to three French heads of state, including Charles de Gaulle. After moving to the United States in 1959, Pépin first worked at Le Pavillon, a storied French restaurant in New York City. From 1960 to 1970, he was director of research and new development for Howard Johnson’s and developed recipes for the restaurant chain. At the same time, he earned his bachelor’s and master’s degrees at Columbia University. A former columnist for The New York Times, his articles have appeared in countless food magazines, notably Food & Wine. He is the recipient of honorary doctorate degrees from five American universities and was awarded France’s highest civilian honor, Le Legion d’Honneur, in 2004, as well as the Chevalier des Arts et Lettres in 1997 and the Mérite Agricole in 1992. For the past 30 years, he has taught in the Culinary Arts Program at Boston University and served as dean of special programs at the International Culinary Center in New York City since 1989. An active supporter of many non-profit organizations, Pépin serves on the board and is a spokesperson for Spoons Across America, an educational program which teaches children and families about healthy eating; and, he participates annually in events for Share our Strength and Taste of the Nation, which are dedicated to ending childhood hunger in America. Also a gifted painter, Pépin has expanded his focus on special menus, landscapes and floral subject matter to explore abstract expressionism. © Copyright 2015 - | The Julia Child Foundation for Gastronomy and the Culinary Arts | All Rights Reserved.